For patients who require more pressure distribution than their current mattress can provide, a pressure relieving overlay may be needed to reduce the risk of pressure sore development. 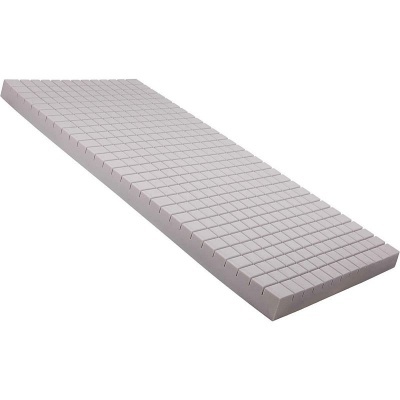 The Harvest Pressure Relief Modular Foam Overlay Double Mattress is an inexpensive one-piece overlay designed to provide increased pressure relief to patients at a medium risk of pressure sore development. This foam overlay is also available in a single mattress version. This overlay mattress has been designed with long-term comfort in mind, featuring a modular layout in the foam. This layout is made up of a series of grooves between square foam sections which boost both pressure distribution and comfort. The grooves allow air to pass through the mattress, preventing the patient from overheating, thus avoiding sweat and subsequent friction. The modular design also means that each section bears weight independently, making for excellent pressure distribution. When it comes to caring for foam cushions, both protection and breathability are crucial. The cover supplied as standard is waterproof, ensuring that no fluids or spills will cause long term damage to your mat. In order to maintain the bounce-back and shape of the foam over time, the cover is vapour-permeable, allowing air to freely pass through the area between the cushion and user. Additionally, the cover is made with two-way stretch material, boosting comfort for the user and resisting tears in the fabric. Please note: The image above displays a single-width mattress, while the product sold on this page is supplied as the double-width version.